Looking as a scrupulous entomologist on the american society of the beginning of the 19th century (Tocqueville’s journey to United States took place in 1831), this book offers a seldom attained analysis on the way democratic societies get organized and how this organization can be linked to the profound nature of men. 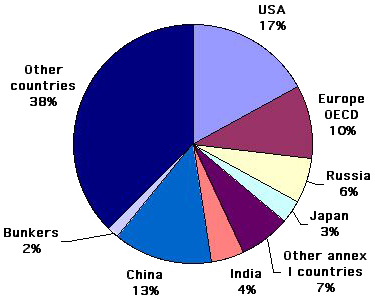 Breakdown of the world greenhouse gas emissions by country or region in 2000, all gases taken into account. All the following countries are democraties: United States, Russia, Japan, all european OECD countries (Germany, France, Great Britain, Italy, Spain, etc), all the other Annex I countries (those that committed to a voluntary decrease of their greenhouse gases emissions through Kyoto), that notably include Canada, Australia, and most Eastern Europe Countries ; and again India, and actually most other countries (that include South Korea, Taiwan, some South East Asia countries, etc). In short, most of the world emissions come from democraties. Source of primary data: UNFCCC, WRI. The processes that should be put in motion to halt the ongoing climate change (or more exactly to prevent a possible catastrophic evolution) are so huge, and would span over such time periods – decades at least and not weeks, that it is legitimate to ask oneself whether we have any chance to meet such a goal when the person that is in command changes every couple years. In front of such a series of visionary prophecies (there is one every three pages, since the reader will also find – in a book written in 1840 – that the world will be split in two zones, one dominated by Russia and the other one by the US, that Southern America will become totally dominated by Northern America, and so on ; if it were not for the style one might think that the book was written last week), how one cannot be very doubtful when reading this other conclusion of the author: totally absorbed by the management of their economy, which will be their “big affair”, democraties will be near-sighted, and unable to see in time the upcoming long term perils. This worrying assertion goes with another major conclusion of this book, that perfectly fits with my own experience: in a democratic regime, the elected are not in charge of being “more visionnary” or “wiser” than the voters, but just in charge of executing the desires of the latter. When a citizen asks to the elected to be more anticipating or more cautious than him(her)self, (s)he is mistaken: in the specifications of the elected’s job, there is no mention of being more audacious than the “global state of the opinion” (on the opposite, (s)he is elected to implement the will of the majority ! ), or of managing our schizophrenia for us. Stopping building roads and highways: everybody is for the local road aimed at supressing the local traffic jam, but once new infrastructure is built it seems difficult to wish a decrease in the general traffic ! In other terms, the implicit conclusion of Tocqueville, stated at a time when climate change was not really a hot topic (but it was already known among physicists ! ), is that it is up to you and me to understand in what way our various wishes might be antagonistic, and to send to the elected an explicit message, free of contradictions. To be totally clear, the day we say to the government: “we have well understood that fighting climate change requires that we progressively increase the price of domestic fuel oil, jet fuel, natural gas, gasoline and diesel, and we have well understood that it will lead computers, houses, beef meat and transportation to cost more, but we accept it because it’s the price to pay for our grand kids to have a comfortable life – or a life at all in some case”, there isn’t the slightest doubt that the government will take the necessary measures the next minute….. as there isn’t the slightest doubt that as long as a majority of the population will be against the elements of solution stated above, nothing of the good magnitude will happen before the trouble starts. I therefore will end with this only piece of advice: before risking any forecast on what might happen in the future, read (or read again) Tocqueville !